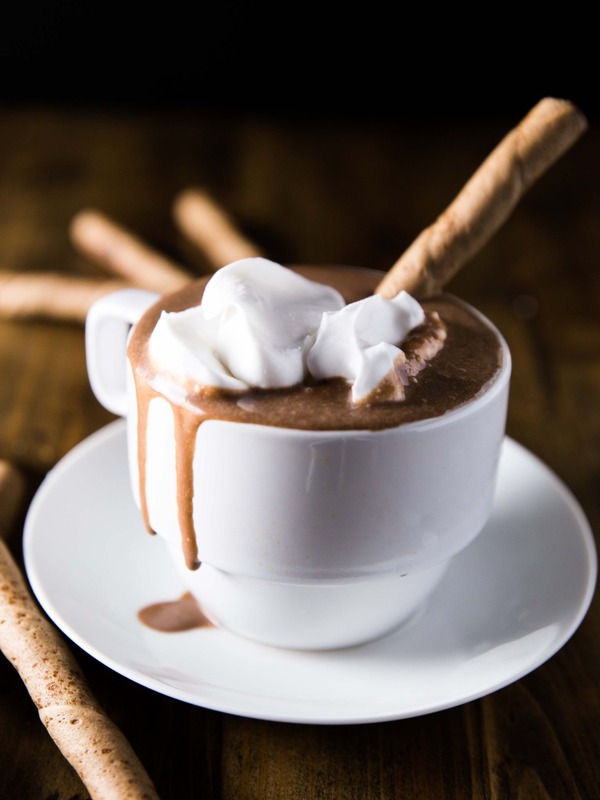 Curb your sweet tooth with this simple recipe for velvety smooth and creamy vegan hot chocolate! Made with just a few ingredients and a couple easy steps! Originally posted on veggie & the beast. Whisk together the sugar, cocoa powder, starch, and salt in a small bowl or measuring cup. Heat the milk and vanilla in a medium-sized saucepan over medium heat until steaming. Add a couple tablespoons of the hot milk to the cocoa mixture and whisk until smooth. This will help you avoid clumps of cocoa in your hot chocolate. Pour the cocoa mixture into the milk pan, and bring to a boil for 5 minutes. It will thicken slightly in this time. If you want a lower-sugar hot chocolate, start with 3 tablespoons cane sugar and adjust to your tastes. I thought 5 was the "sweet spot," if you will.